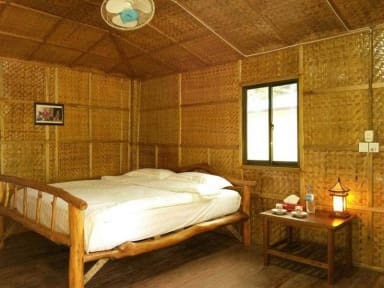 We are a beautiful and cozy family-run guest house with a personal touch, Our rooms are spread out within five bungalows, all constructed in a classic wooden bamboo style architecture holding seven rooms with private bathroom and balcony. For our low-budged guests we also run three economy rooms with a shared bathroom. We provide fast & free WiFi and in our restaurant you can enjoy your breakfast, lunch and dinner. We like it green and are proud to be the first and - until now - the only environment-friendly accommodation in Ngwe Saung: Our 24h-power supply service is mostly provided by a modern solar system and LED lighting.